Not only is it a holiday weekend, but our broadband has been down most of the time, so it’s been epic for reading. I polished off Fraud: An American History from Barnum to Madoff by Edward Balleisen. 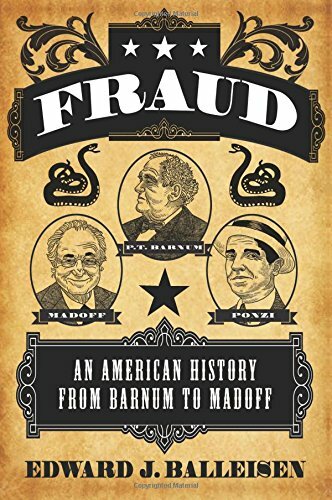 This is a scoot through some of the more colourful chapters of US financial history, constructed around the line of argument that there has been a steady swing of the pendulum when it comes to official responses to fraud, or a kind of dialectic. A riproaring era of innovation – when inherent asymmetries of information are made greater by the newness of what the market has to offer – is characterised by a ‘caveat emptor’ approach. If it looks too good to be true, it is – and anyway, is a product that doesn’t work fraudulent or its era’s equivalent of vapourware? There’s a fuzzy boundary, an enduring “dilemma of how to distinguish unacceptable deception from the pardonable exaggerations and enthusiastic dissembling that so often characterized efforts by new firms to establish a commercial foothold.” Perhaps, if it succeeds, it’s enthusiasm, but if it fails, then it’s fraud. No innovation would get off the ground without potentially delusional belief in its prospects. Some people intend to be fraudsters, others have it thrust upon them by over-optimism and failure. But as the scandals pile up, and particularly when great numbers of ordinary consumers or savers are affected, officialdom intervenes in some way. This can be government intervention, as in the US Post Office’s crackdown on mail fraud – which nearly strangled the famous Sears, Roebuck mail order catalogue in its infancy (purveying, as it did, quack medicines and dodgy ‘free gifts’ – or civil society as in the business-backed Better Business Bureaux. The book ends by observing that the pendulum may be about to swing back to cracking down, as the multiple bedraggled chickens of the freewheeling global financial era flutter home; but who can say for sure, looking at the evergreen inclination to fleece retail savers and investors. For finance, of course, is the most fertile territory for fraud. The pickings are rich, the asymmetries of information are gargantuan, and the innovation is still plentiful. This is a story with many volumes still to come.